Abbi Nilssen fra Bærum vant dameklassen under helgens Norgescup på Stovner etter norgeshistoriens jevneste og mest spennende damefinaler noen sinne. Les hele historien i detalj her. Artikkelen er skrevet på engelsk av Jonathan Gewirtz som fulgte finalegruppa hele runden på søndag. The 3rd round of the Stovnerputten womens Disc Golf Tournament division started with a very tightly grouped collection of talented ladies, all of whom were playing well. The hard throwing Swede, Linda Emanuelsson, led the pack with a total score of 135 after having the best round (70; 867 Rating) on a windy Saturday afternoon. 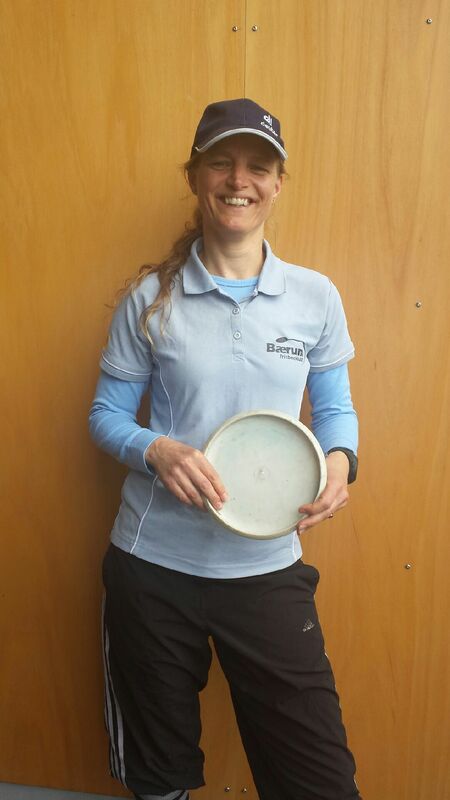 Recently married Trondheim Frisbeeklubb member Sigrid Sandum, one of 2 tournament favorites fresh of her top 3 finish at Sula, wasn’t far behind with a total of 137 (66 + 71) . Bærum Frisbeeklubb’s Abbi Nilssen and Ewa Bergquist from Sola filled out the remainder of the 4 person leader group. Abbi based on her solid if unspectacular pair of rounds, 69 and 74 for a total of 143, leaving her tied for 3rd place with Ewa, 8 throws behind the leader. Ewa was doing her best Jekyll and Hyde impersonation with a “tournament best” round of 64 in the morning and a disappointing 79 in the afternoon after the wind picked up. 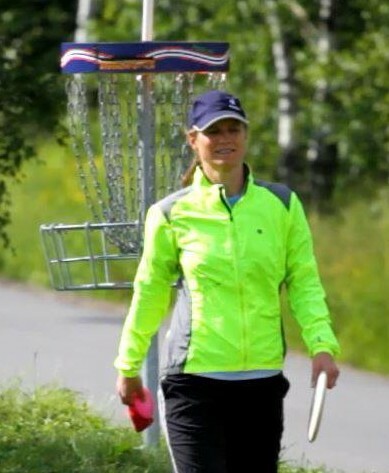 Incidentally, her morning round rating of 907 was the tournament’s only performance that broke the 900 rating barrier for the «Disc Golf Girls of Norway». The other favorite, on her home course, and the highest rated player of all the competitors at 876 was Stovner’s own Linda Wulff. She fell into the second group because of her uncharacteristically high score of 76 on Saturday afternoon, giving some breathing room to the leaders, but certainly not out of striking distance with a 2 round tally of 144. Throw in Swedish participant Ann Lundberg’s 144 throw total and you had 6 players separated by 9 throws! It was still anyone’s tournament to win, but with Linda Wulff struggling and Linda Emmanuelsson never before having won a Norwegian series event, Sigrid seemed well positioned for yet another Norwegian tournament victory. The overall score didn’t change much over the first 7 holes with all of the competitors playing 4-6 throws above par, each with a few more bogey/double-bogeys than they would have liked. It was at # 8, the long downwind hole with the tight fairway due to OB lines on both sides, where things started to get interesting. Sigrid was the first of the group to throw off the new, elevated, temporary, asphalt tee. Her low, hard, backhand drive screamed into out of bounds territory on the right side, but appeared to be long enough to give the disc a decent chance to land or skip back in. No one anticipated the out-of-bounds stake coming into play, but that it did, and quickly. The disc was on a collision course with the wooden marker! Sigrid breathed a sigh of relief and left the tee box laughing, but with an accelerated heart rate after seeing the disc bounce sharply left, into the fairway. Abbi also flirted with the OB as her 150G Star Sidewinder faded left and downhill at the end of its flight, nestling itself just a few centimeters from the line. Thats when things fell apart for Linda E. Her long backhand drive left the field of play early, and never came back. Her next throw was also OB on the right side, with a net gain of only 2 meters. She adjusted the direction of her approach to make sure she did not make the same mistake a 3rd time, but her power betrayed her, and her throw sailed OB just beyond the target. This time on the left side of the fairway. An approach and a putt later, her nightmare finally ended. Sigrid took a 4 on the same hole and walked to the 9th tee with a 3 shot lead over Linda, 5 over Abbi and Ewa safely in her rear view mirror, 7 throws behind. Meanwhile, Abbi Nilssen, the 845 rated player, mother of two, who had played onlyone tournament and had practiced 1 or 2 times in 2013 wasn’t playing spectacular either. She teetered on the edge of a triple bogey “implosion” on #10, but hit the putt there for a 6. She mixed in a few pars with her pair of double bogeys and three bogeys over that decisive 8 hole stretch, and that was enough to bring her even with Linda after 15 holes. Abbi parred hole #16 while Linda bogeyed and after a short drive, Abbi played a beautiful approach around the tall wide tree protecting the basket on #17. It was a blind, high, arching backhand hyzer shot inspired by the now injured Lydie Hellgren andit landed a few meters behind the basket. Abbi missed the short putt into the wind that would have given her a two stroke lead over the fading Swede and walked to #18 thinking she was behind Sigrid by a single throw (turns out she was ahead of her by one), while maintaining her one shot lead over Linda when she was too was unable to make par there. Abbi and Ewa walked away and held their fingers in their ears in order to avoid hearing the scores which tournament director Jon Marthinsen insisted be read aloud to the gathering group of spectators. Sigrid was first off the tee and played what she thought was a safe shot on the right side of the fairway. The shot was beautifully shaped with a standard right to left hyzer flight path around the trees, but the wind pushed it a few meters too far! When the spotter finally crossed his arms with the OB signal, Abbi’s strategy became crystal clear. All she needed to win was par! A drive and approach later and Abbi’s disc lay a few short meters from the basket. A putt she had failed to make on multiple occasions during the round. Sigrid landed her next drive attempt in bounds and within her impressive putting range, but she needed to make her next putt to have any chance of a playoff. It was then that she suffered a final bit of bad luck, hitting the basket on her putt and rolling onto the street for her final triple bogey of the day. Somebody forgot to tell Linda that it was over though, and she stepped up to the challenge with a solid drive and an approach that left her in a lay-in position for an overall score of 212. It was then that Abbi remembered the story about the «Big Bad Wulff». She turned to me and asked, «What has Linda Wulff done in the final round»? I admitted that I had no idea. Abbi turned and walked to her disc and I had no idea what she was going to do. Would she go for the basket perched precariously on top of the mound and risk rolling OB as Sigrid had or would she lay up up next to the basket and force a playoff between her and the Linda from Sweden? Her mind was made up and she decided to go for the win, then and there. She hit the band on the top of the basket hard and it made a loud “pang”, but the disc dropped harmlessly to the ground without rolling. She laid it in for an overall score of 212. It would be a playoff between The Swede and the last remaining Norwegian, or so they thought! Then the news came in that despite her 8 throws on hole 16, Linda Wulff had turned in a 68, giving her a total of 212. A three-way tie!! The women had to wait approximately a half hour for the men to finish before their playoff round could begin. They would play 18 over and over again until a winner emerged. After 2 rounds of par frames, with all parties playing safely, Abbi landed her drive in bounds a third time. The Lindas, however, did not and after missing their second attempts, they graciously conceded, anticlimactically giving Abbi her first Norwegian Championship Series win ever and 3.500 NOK! An extremely exciting final round (and playoff), if not the highest rated final round. At least 5 players can look back at the day’s play and think «if only I hadn’t done X, Y or Z and I would have easily won…» That’s golf! Over three rounds, 54 holes and 212 throws, Abbi never had the lead.